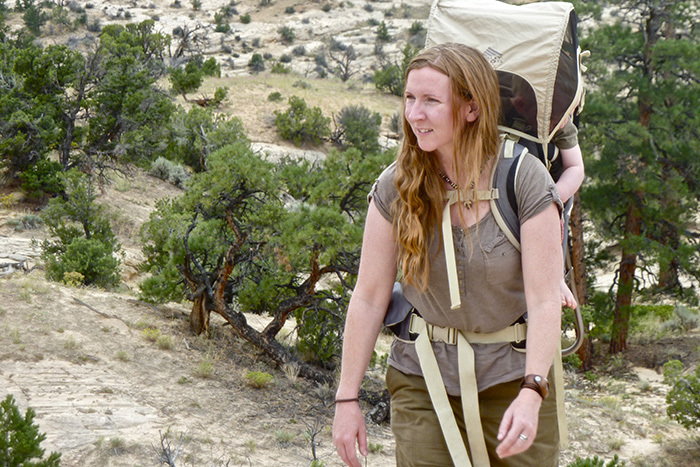 Lisa Fenton during a field research trip in Utah, carrying her son Finn on her back. My guest on this podcast is Lisa Fenton, who joins me to discuss her research on bushcraft and indigenous knowledge transmissions. 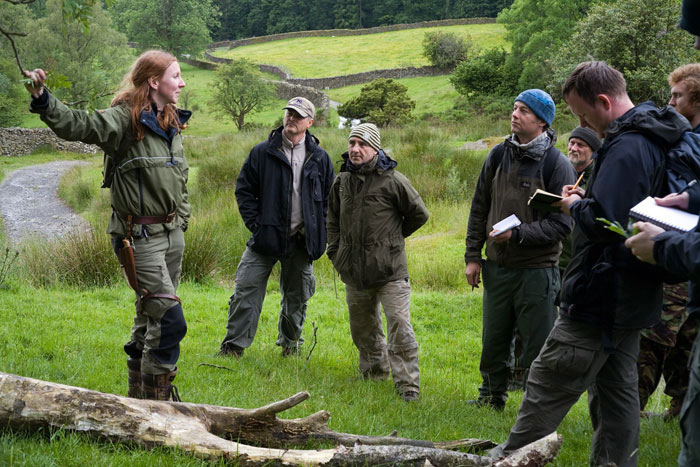 Lisa is one of the founders of the Woodsmoke School of Bushcraft and Wilderness Survival, based in the Lake District, in the north west of England. Lisa and her partner Ben McNutt apprenticed with Ray Mears in the late 1990s and early 2000s before going on to set up Woodsmoke together in 2001. In 2006 Lisa’s interest in anthropology and ethnobotany led her to enrol in a masters degree in ethnobotany offered by Kent University in conjunction with Kew Gardens. Lisa obtained her MSc in 2008, gaining a ‘distinction’ for her final thesis on British wild plant foods. Lisa followed this by reading for a PhD in ethnobiology at Kent University’s School of Anthropology and Conservation, which she has recently completed, gaining her doctorate. Dr Fenton’s research area was ‘Bushcraft and Indigenous Knowledge Transmissions’, her work examining the relationship between Bushcraft and indigenous knowledge. 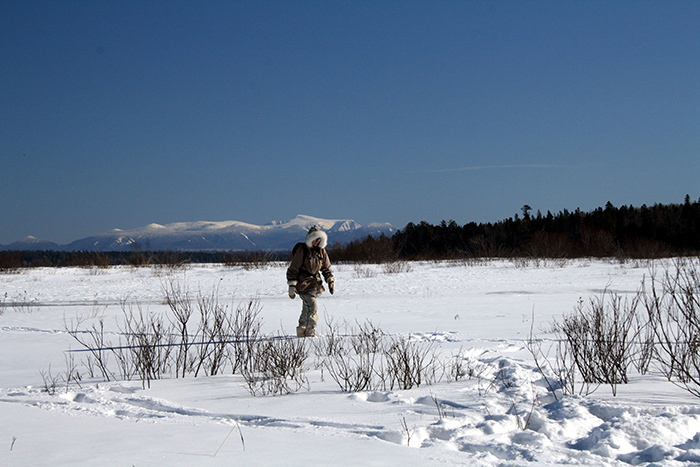 Lisa’s research was supervised by the distinguished anthropologist Prof. Roy Ellen and comprised an historical review, an examination of ethnographic literature, field work in multiple locations, including Sweden the UK and the USA, in addition to interviewing professional Bushcraft instructors and surveying those who use Bushcraft as part of their outdoor leisure pursuits. Case studies of several iconic aspects of Bushcraft including the figure-4 deadfall trap and fire-by-friction were used to explore a number of themes in the contemporary Bushcraft world. I was keen to invite Lisa onto this podcast to find out more about her academic work and the unique perspectives she’s gained from her research. Lisa in Namibia in 2003. Lisa teaching in the English Lake District, where she is based. Lisa on a north woods adventure in Maine. Fascinating. Possibly the best discussion on ALL aspects of ‘bushcraft’ I’ve ever listened to – particularly the latter 20 minutes. Thank you very much. I actually wanted to go straight back to the start and listen to it again. Is it actually possible to read a copy of Lisa’s thesis anywhere? Thanks for your positive feedback on this episode. I’m very gratified you found it so valuable. As far as I know Lisa’s thesis is not yet publicly available but I have dropped her a message to ask if it will be at some stage. Thank you for you comments. I am very keen for the research so be put into the public domain and as such am beginning to work towards publishing the thesis. I am advised by my academic colleagues that the work has opened a new field of academic enquiry, which is exciting for the future of Bushcraft, and which motivates me to work towards publishing :)! Thanks for taking the time to reply. I really look forward to seeing it. It crosses my mind that it would make a fantastic subject for a documentary series, combining history, philosophy and ethno/anthropology in a really accessible (and increasingly popular) subject. Perhaps someone should contact the BBC! Personally, the one message that really hit home for me was the comparison between survivalism and bushcraft, i.e. running away from nature and running toward nature – hate/love. I wonder if there are parallels with the movements of the 60s/70s and the Cold War? It is also interesting that the main survivalist core appears to be in the USA, where bushcraft is often portrayed as an additional skillset (along with firearms of course) to help you survive and get back to civilisation; whereas in Europe, bushcraft strikes me as being more separate and about getting back toward a more ecological, holistic way of life and away from technology. Fear of the system and dissatisfaction with the system perhaps. Enough already! I could talk for hours on the subject! Really looking forward to listening to this – have downloaded it to enjoy once the week’s madness has subsided. Lisa’s articles in The Bushcraft Magazine are something I’ve enjoyed a lot in the past. Also enjoyed your “gig” onstage at The Bushcraft Show” Paul. Can’t help but think that you should have done an “Ask Paul Kirtley” instead though. The thought of doing a live #AskPaulKirtley did cross my mind but in the end I wanted to deliver a keynote with a bigger and more far-reaching message. I think there will be some further opportunities to do live Q&A sessions. And if I’m back at the Bushcraft Show next year, I’ll look at a way of including one while I’m there. Glad you enjoyed the talk on Sunday. I really appreciate you coming to listen to what I had to say. I’m sure you’ll enjoy the conversation between myself and Lisa too. I listened to this whilst out on a long walk yesterday. I normally don’t indulge in using tech whilst out and about, but there was a long ugly boring bit that I needed to get through and listening to this podcast was a great remedy to that. I really enjoyed it, lots to think about, so thanks to you both. Glad we were able to keep you company and easy the boring/ugly bit. One of my favourite podcasts so far. What a stimulating interview with such broad topic coverage. Thank you so much to Dr Fenton and Mr Kirtly for giving me such an enjoyable hour and forty five minutes. Our pleasure Paul. Thanks for your feedback. I’m glad you enjoyed it so much. Still would like you to see you interject with your guests more Paul on these podcasts more frequently with your expertise to make the podcast flow more interestingly for your audience. Essentially challenge them more. I see many opportunities for you. Thanks for your feedback. I make a conscious effort not to interrupt people but I take your comments onboard and will integrate them going forwards. It’s all been said above Paul! Fascinating, highly stimulating – one of the most interesting to date. The documentry idea may be worth exploring for someone. There’s certainly a wealth of material there to use. Thank you once again for your efforts in bringing us these podcasts. Great to hear that you enjoyed the podcast so much. We only touched superficially on a few of the areas covered in the research….so there is a LOT more rich and interesting material that the research raised and delved into. It was a fascinating journey in bringing it all together to understand the subject at quite a deep philosophical level. It was really enjoyable to be able to chat about it a bit…thanks Paul! It’s my pleasure to bring these podcasts to the wider world. But thank you for your feedback. It’s motivational to know these sessions are appreciated. FANTASTIC podcast Paul and Lisa. Thank you. Whilst you talked alot about academia, you presented it in laymans terms (simplicity) for the likes of me. H.O.O.R.A.Y. that someone has at last had the courage to identify and talk of how we (our ‘bushcraft’ ancestors) unethically facilitated in (and are thus complicit in) the cancerous growth of Big Pharma, Big Business and Big Government / Society through our ‘forbearers’ abuse of indigenous people to “survive”. It really is a crime against humanity that our colonial imperialist “explorer”, “adventurer” and “pioneer” forbearers exploited, manipulated, ‘raped and pillaged’ the knowledge, skills, resources and good will of indigenous peoples around the world in bygone times to meet their own egotistical and commercial ends. The current ‘bushcraft’ community now owe it to indigenous people to protect them, their ways and their communities. WE ALL would do well to remember that indigenous people are the lifeblood of modern society; only an arrogant and egotistical fools (like many of our “educated” ancestors) will forget this and/or think otherwise. We are forever indebted to indigenous people for their knowledge, skills and resources, and need to start halting and reversing the destruction being wreaked by Big Pharma, Big Business, and Big Government / Society. Interesting too, the link Lisa made between military and ‘bushcraft’. The current Scouts and Guides movements originally stem from the military – if people do their research, the Scouts in effect, albeit more subtly and clandestinely, were set up to recruit and grooming “child soldiers” of the time…a very uncomfortable truth. Gladly today, things are very different. Fab podcast. I’ve yet to learn to download it to my phone (have tried and tried, lol). Hi Craig, and thanks :)! Indeed, there are a lot of layers to this subject, and some of them very politically uncomfortable, but we can only move towards decolonisation by first understanding the processes and consequences of colonisation so as not to repeat it in our personal practice and in the practice of contemporary bushcraft more broadly. This is where I feel we need to be very careful of the militaristic aspects (at an ideological level) that are being extolled by popular media entertainment, so that many people think survivalism is bushcraft and vice versa when in fact they are not. Congratulations Paul! This was a brilliant episode, I even downloaded the transcript so I could read over it and do some more research. For me bushcraft is definitely to be more self reliant, I’m always researching how to take thinks to a more basic level. I need a pot, how did they make them before steel, so on and so forth. Not that I’m against using modern technology, I just want the understanding and skill in case it’s not at hand. An amazing podcast rich in many ‘veins of thought’ and philosophy. The subject of ‘Bushcraft’ and the study of it is constantly creating avenues of understanding and opportunity at so many levels. Connecting people with their natural surroundings , connecting us with our past , putting our lives in to perspective , creating moral boundaries , providing life affirming experiences , re igniting the spark for learning , forging new levels of confidence and self worth..I guess the list of positives attributable to this subject is ‘endless’. Two strong themes come through. Lisa’s academic focus on the subject is both insightful and provocative and yet very relaxed. As a listener I felt compelled to hear what she had to say. Secondly that this subject is all about making sense of nature and our place within it and realising how positive that relationship is. Once again thank you Lisa and Paul a quality podcast. Thanks for your feedback Mark. Glad you found it stimulating. Thanks for such great feedback Mark…I think you hit the nail, especially when you say that ultimately it’s ‘all about making sense of nature and our place within it and realising how positive that relationship is.’ There is so much to explore with Bushcraft and with its relationship to Indigenous knowledge of Land to further understanding our human relationships to the natural world through skill, knowledge and participation with it. Thoroughly enjoyed that,well conducted interview. To hear someone speak with such knowledge and passion is a privilege. I’m very glad you enjoyed this Dean. Thanks for taking the time to leave a comment. I appreciate your feedback and yes, I do have a habit of making these affirmatory noises. I try to structure these as conversations rather than interviews and with some guests it helps to keep it very relaxed in this fashion. But yes, I take your point and will do my best to minimise the distraction in future. Glad you enjoyed the conversation Scott! Enjoyed this podcast very much! It’s my second time listening and still it captivates my interest. And like you Paul, I find myself nodding, smiling in agreement, trying to remember some of those names Lisa forgot, or simply just basking in the vast knowledge Lisa has gained on her journey. Being Canadian, of Metis heritage, the roots of bushcraft are all too familiar, though I am by no means an expert, just an incidental participant. I recall many of my elders and relatives who did things just because it was what was done: chop wood, cook on open fires, fillet fish, dress game, forage to supplement their larder, preserve food, use the cold of winter to freeze food without relying on electrical freezers, just flowing with the seasons and taking advantage of each. The casual presentation of your podcasts makes me feel part of the room, where I sit, just enjoying the company, both yours and your guests’. Your podcasts are great to listen to in front of a soft campfire, sipping a casual drink. Please bring Lisa back for more. Had I only been aware that it was possible to earn a degree so closley related to bushcraft I would have probably stayed in school. Throughly enjoyed the podcast. Keep up the good work, both of you. Yes, the career advice I received at school wasn’t much better. I’ve been luck to find my way to where I am career-wise. Even so, no degrees in bushcraft for me though… Lisa has truly forged a new path. Hi Adrian, it’s good to hear from you. Glad you found this podcast thought-provoking. I’m a new listener to the podcast. Really enjoying it! I love the laid back conversational style which invites the listener into the depths of your knowledge. Lisa, I really appreciate all the work you’ve done and your willingness to share it. As an Australian this topic particularly hit home. Collectively Australia is only beginning to truly appreciate and respect Indigenous knowledge and culture. Bushcraft as you’ve both described it seems to me such a powerful bridge to build that relationship, sorely needed in this country.